And now boasts a new and modern look! 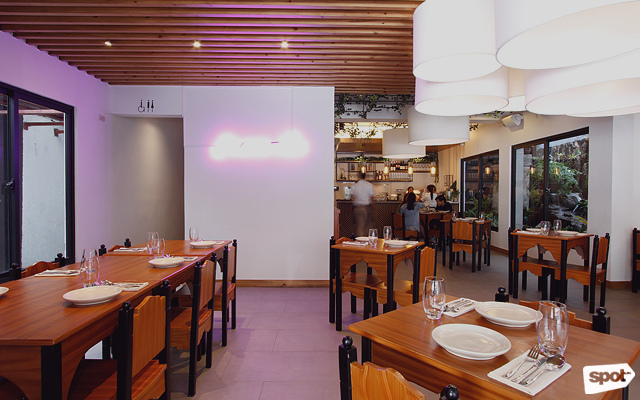 (SPOT.ph) There’s nothing we love more than what the French call a “relooking”—yes, that is their slang for “makeover.” And while we can't drop everything to fly off to France, you can still bet that Muang Thai’s new look and new items are très bien. You’d almost mistake it for a spa—that’s how lush it’s gotten. 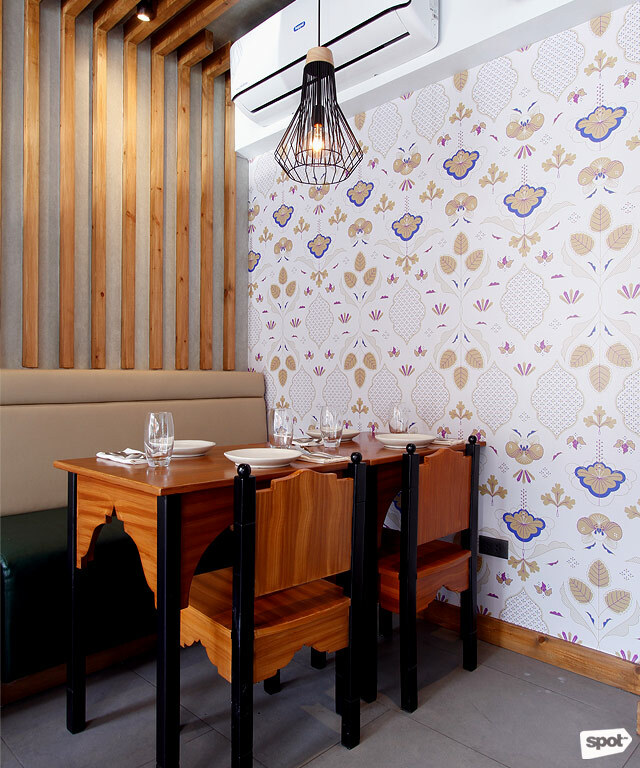 We’re living for the soft accents of artificial lighting, along with all the distinctly Southeast Asian touches that, with the help of a good eye, wind up being a real class act. 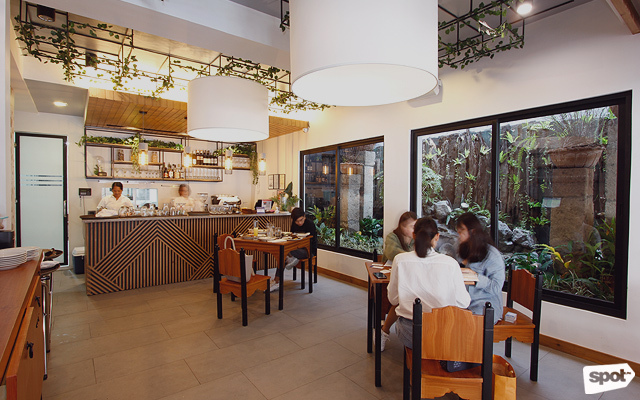 They’ve also managed to make good use of natural light—it's in one of our favorite parts of Quezon City with unobtrusive greenery—giving the whole place a real Zen glow. Who couldn’t use a little more of that these days? 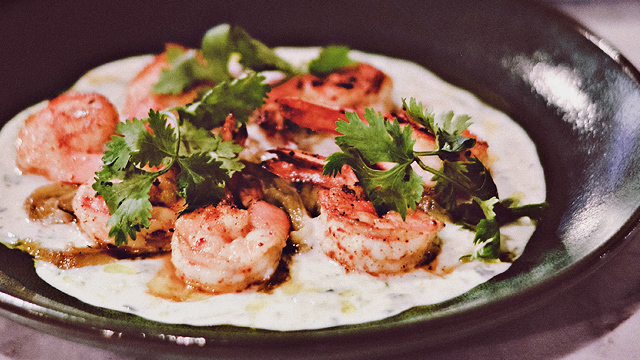 The char-grilled Satay Gai is great as a quick snack, too. 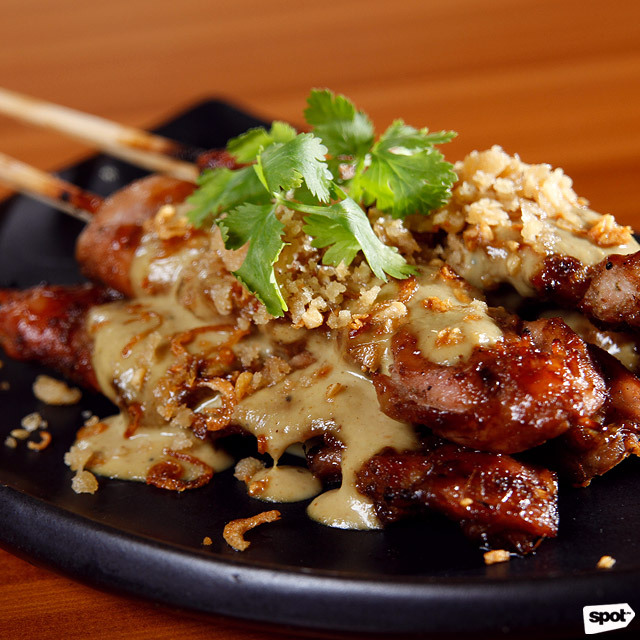 Kicking off with a mainstay—a classic, really—the Satay Gai (P250) remains some of the most tender yet still just-charred chicken satay that’s ever graced a person’s chompers. 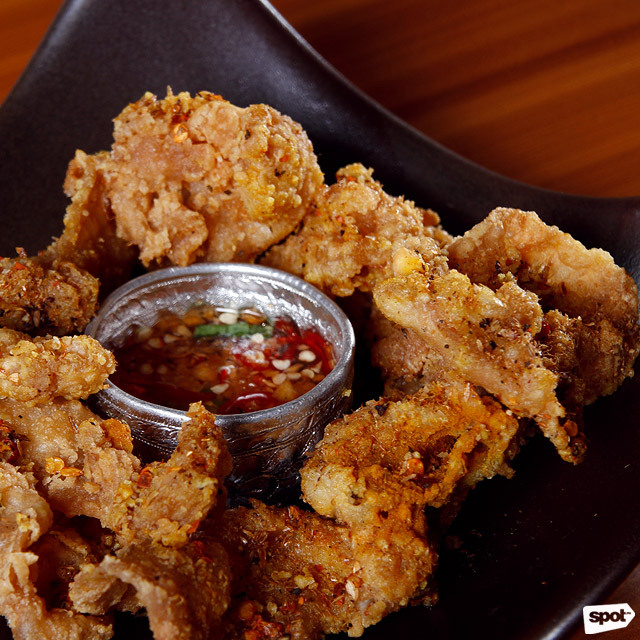 If you like your chicken to have a little more crunch, the Thai Fried Chicken Skin (P150) is the epitome of spicy, savory, probably-bad-for-you-but-who-cares goodness. Feeling a little guilty? 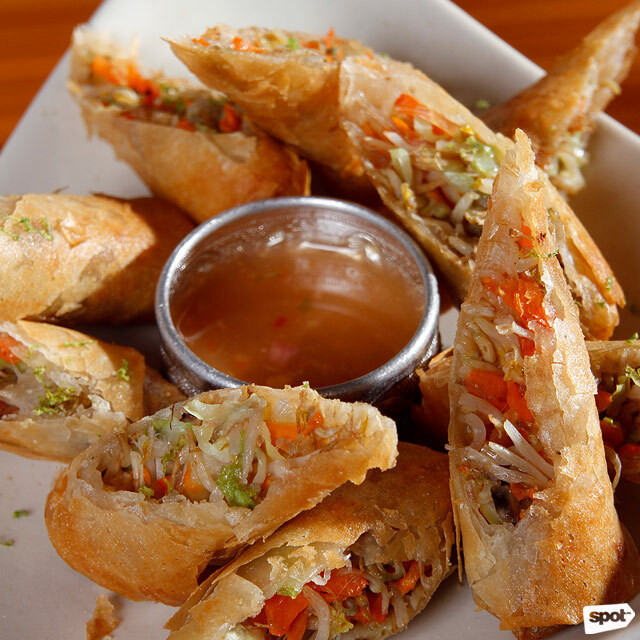 The Spring Rolls (P200) are an excellent compromise, giving you a similar feel while being (arguably, and barely) healthier for you. That sweet and sour chili sauce on the side ain’t nothing to sniff at, either, now that we’re talking about it. 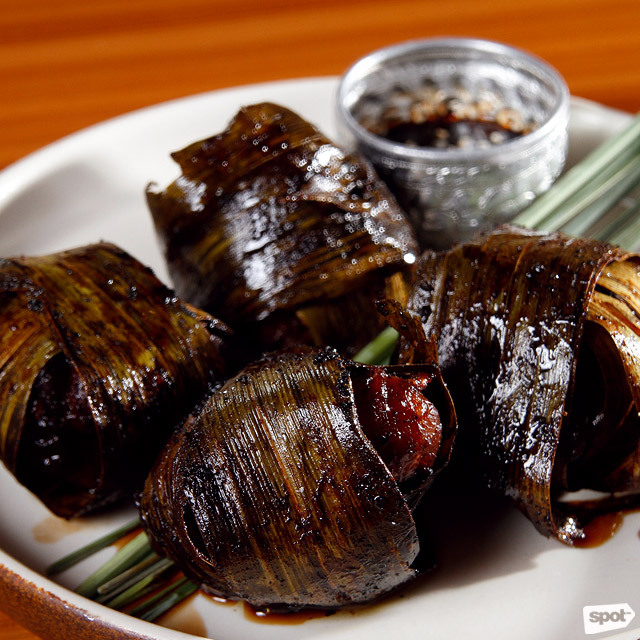 Muang Thai's version of the Gai Hot Bai Toey will remind you of the Filipino classic chicken pandan. 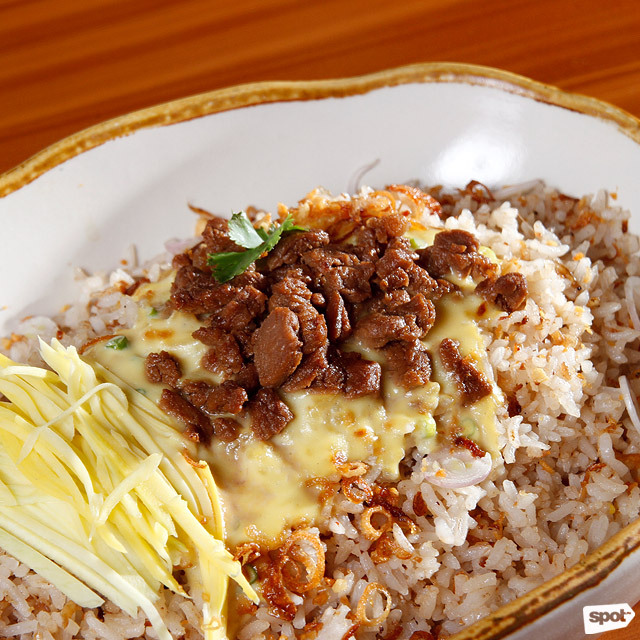 Bagoong rice lovers will enjoy the Khao Kluk Kapi. But Muang Thai just can’t seem to get chicken wrong, if we’re being honest. 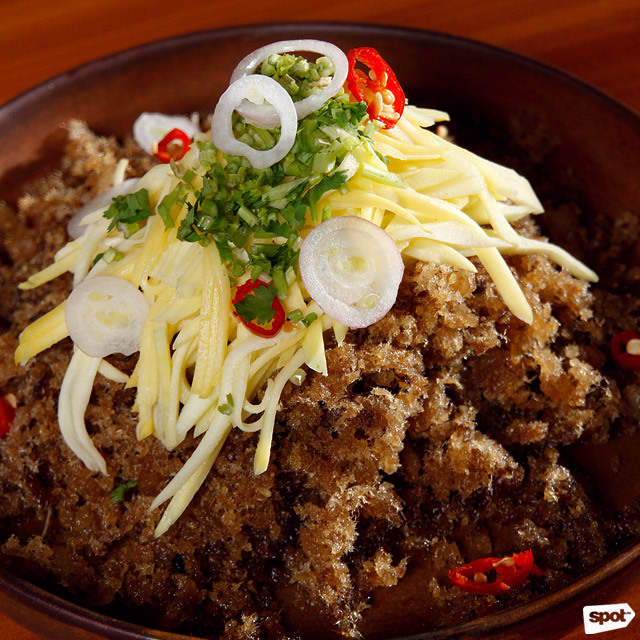 Their Gai Hot Bai Toey (P310) is another classic Asian dish you shouldn’t skip, especially when paired with the Khao Kluk Kapi (P360). It’s the familiar flavors of pandan chicken and shrimp paste fried rice, respectively, that draw you in, but it’s how well they’re executed that keeps you. We’re talking perfectly charred, mouthwateringly juicy, served with a soy-sesame sauce that you barely even need but remains lovely to have. 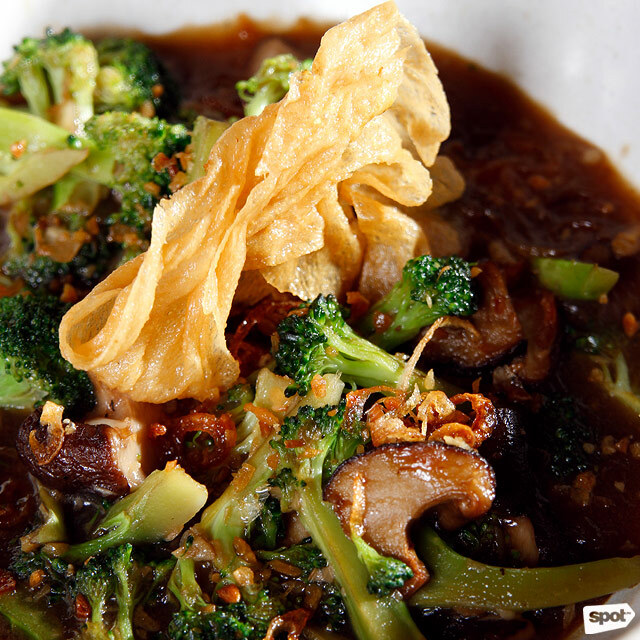 It's easy to be a veggie lover with Muang Thai's Stir-Fried Beef with Broccoli. That fried rice is just about the perfect foil for everything available at Muang Thai. The Stir-Fried Beef with Broccoli (P320) serves up the easiest way to get the veggie haters to eat their greens, as well as some much-needed moisture in this sea of varying textures, via the natural flavors of the meat and broccoli (how grown up are we?!) and a bed of that salty-sweet sauce. 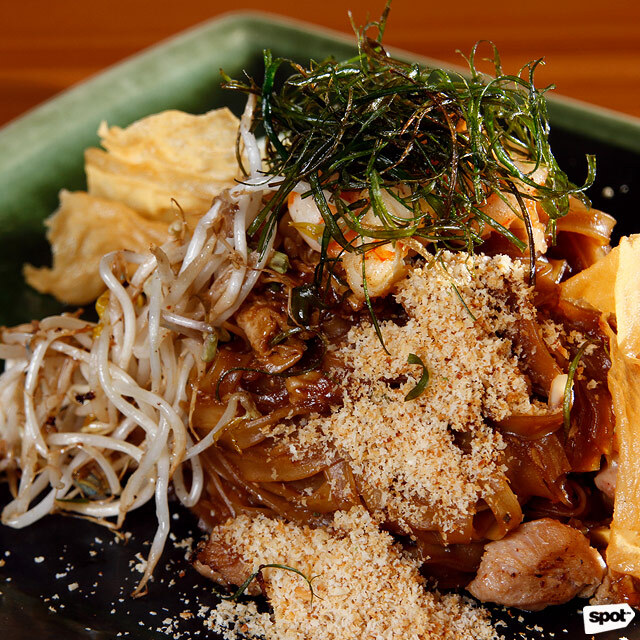 You can't go wrong with the classic Pad Thai. Fresh green-mango slivers add a refreshing taste to the Yum Pla Dook Fu. 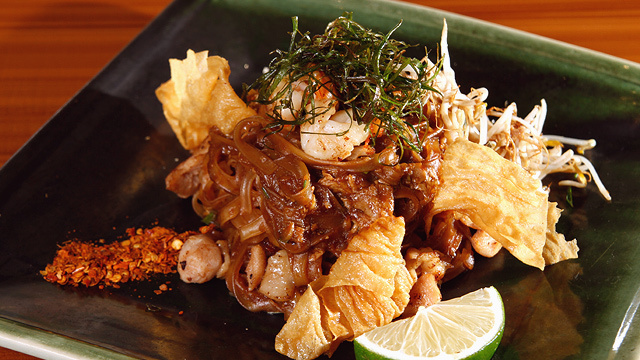 The Pad Thai (P360) here is, perhaps, some of the best we’ve had so far. Somehow the amount they serve you is sufficient for both a little solo sobbing—necessary in these dark times—or sharing with a friend or two. No gummy noodles in sight—just a great venture into spice and texture and the general savory-sweet stylings that Southeast Asia is known and beloved for. Need a little push further? Their Yum Pla Dook Fu (P260) provides some extra salty umami crunch if you really need it, because since when has crispy fried catfish let you down? The slivers of green mango give it the right amount of kick to keep things interesting. The coconut milk's natural sweetness perfectly complements the tangy mango. 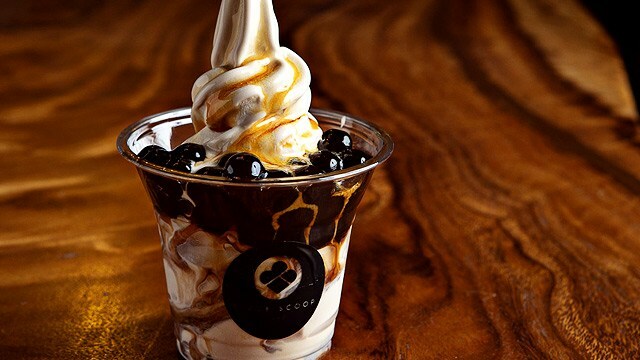 Here's another tasty coconut-based treat to end your meal. 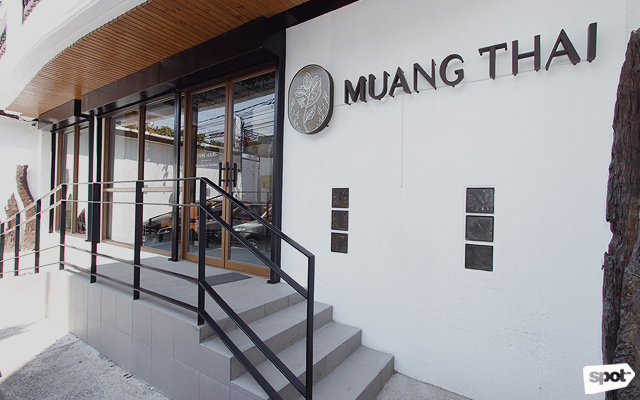 The last but in no way the least of Muang Thai’s many selling points is their dessert lineup. 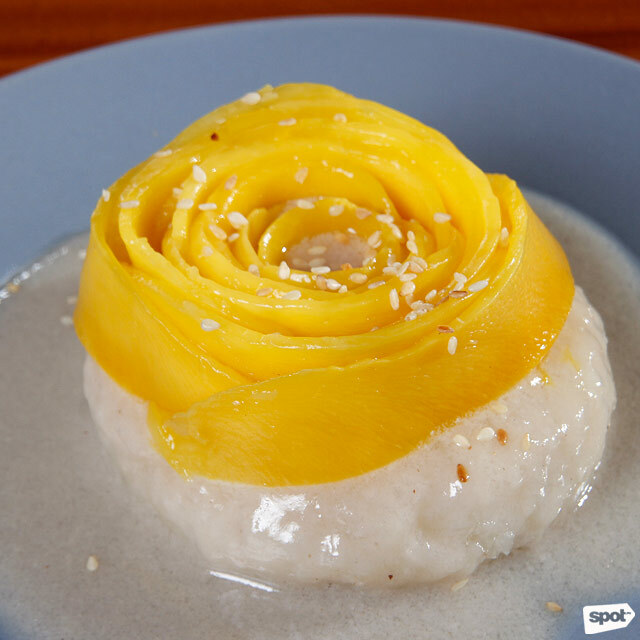 That Mango Sticky Rice (P110) is, simply put, top-notch; all the sweetness of the coconut sauce creates the perfect foundation of the just-ripe mango, giving you enough contrasting tang. 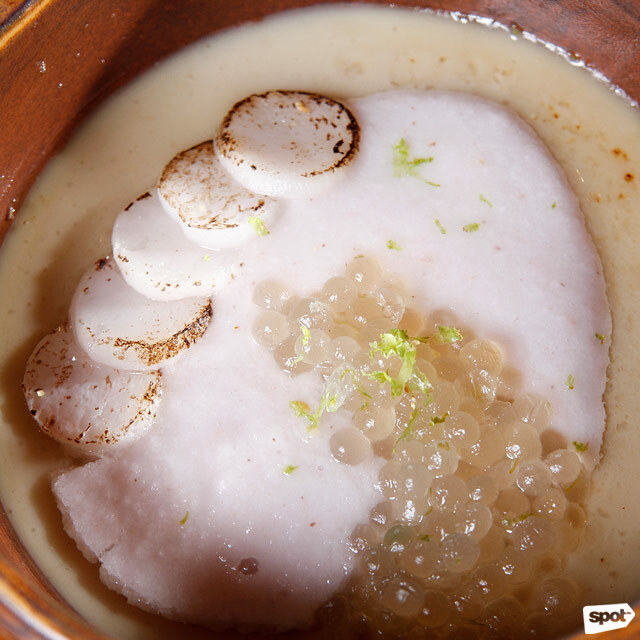 But if you feel like fully leaning into the tropical glacé, the Coco Flan (P100) is the bowl for you. The flavor is deep, but not at all cloying. God help those who supposedly “can’t stand” coconut—you might just meet your match here.